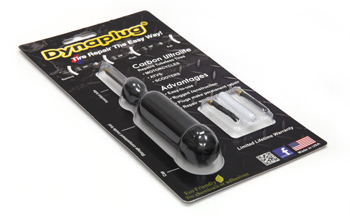 The Carbon Ultralite edition is recommended for repairing the tread of tires on two-wheeled and off-road vehicles like motorcycles, scooters and ATVS. Molded in Glass-Filled Nylon, it’s extremely rigid and strong but weighs only 1.2 ounces. 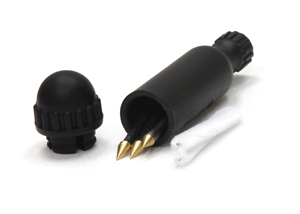 The push-on silicone end cap holds the insertion tube and seals the interior storage compartment. Engineered for repairing punctures in tubeless tires for motorcycles, ATVs, scooters, and garden tractors with a maximum tire thickness of 1-1/8” and a minimum thickness of 3/16” at the point of the puncture. Easy-to-use, neat and clean. No need for “reamers,” messy glues or solvents.